Observations from NASA's Hubble and ESA's Gaia telescope have given researchers the most precise measurements to date of the universe's expansion rate. Scientists measured the distances between nearby galaxies using stars called Cepheid variables, which have a standardized brightness pattern. Our universe's rate of expansion keeps getting stranger. New data continues to show a discrepancy in how fast the universe expands in nearby realms and more distant locations. The study's researchers said this "tension" could mean we need to revise our understanding of the physics structuring the universe, which could include exotic elements such as dark matter and dark energy. But the more distant background universe, according to previous measurements from the Planck telescope, is moving somewhat slower at 67 kilometers (41.6 miles) per second per megaparsec. In fact, the discrepancy between the two measurements keeps getting wider as the researchers refine their work. The new data shows a wider gap between the measurements that is about four times the size of their combined uncertainty — a value that reflects their level of confidence in the results — team members said in a statement. "At this point, clearly it's not simply some gross error in any one measurement," lead author Adam Riess, a senior member of the science staff at the Space Telescope Science Institute (STScI) in Baltimore, which manages Hubble operations, said in the statement. "It's as though you predicted how tall a child would become from a growth chart, and then found the adult he or she became greatly exceeded the prediction. We are very perplexed," added Riess, who is also an astronomy and physics professor at Johns Hopkins University in Baltimore. The universe is expanding and accelerating in its expansion as it grows, for reasons that are poorly understood. Some scientists suggest this is due to contributions from dark matter and dark energy, which are mysterious forms of matter and energy that are visible only through their influence on other objects. Others suggest there may be an undiscovered type of subatomic particle responsible for the expansion, according to the statement. 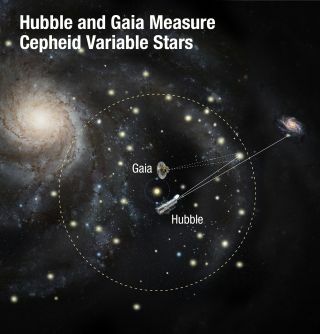 Hubble and Gaia performed their measurements by examining Cepheid variables, a type of star that brightens and dims in a predictable pattern. The pattern allows scientists to learn how far away these stars are from us. The data is then used to measure the universe's expansion rate, which is also called the Hubble constant. That constant is also used to estimate the age of the universe, which makes it a fundamental equation for astronomers. Planck, however, focused on what the universe used to look like some 360,000 years after the Big Bang that formed our universe (which happened about 13.8 billion years ago). The echoes of the Big Bang form a microwave signature across the entire sky that is called the cosmic microwave background. Planck measures the size of the ripples, which shows information such as how much dark matter there is, how much normal matter there is, and the trajectory of the universe's expansion. "These measurements, still being assessed, allow scientists to predict how the early universe would likely have evolved into the expansion rate we can measure today," STScI representatives said in the statement. "However, those predictions don't seem to match the new measurements of our nearby contemporary universe." Riess and his team members have been refining their measurements of the universe's expansion rate since 2005, under an initiative known as Supernova H0 for the Equation of State (SHOES). The latest measurements have an uncertainty of only 2.2 percent, in large part due to the addition of data from Gaia — a newer telescope that can map the movements of stars to high precision. Gaia's contribution was measuring the distance to 50 Cepheid variables in the Milky Way, while Hubble measured the Cepheids' brightness. The two telescopes' combined efforts allowed astronomers to "more accurately calibrate the Cepheids and then use those [Cepheids] seen outside the Milky Way as outpost markers," STScI said. The collaboration aims to reduce the Hubble constant uncertainty to 1 percent by the 2020s, but as for the new results, a study based on them was published July 12 in the Astrophysical Journal.